Navy Blue – is considered a rich and regal color and it is commonly used for lifting the mood of an art or room or brand theme. Promotional navy & white 62” arc vented golf course umbrellas are largely sought by marketers who wish to present their brand themes in a regally appetizing manner. 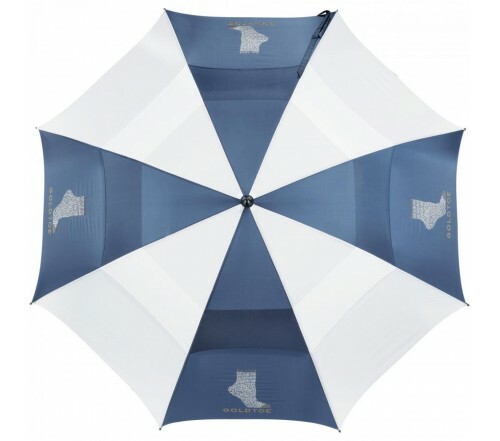 Personalized navy & white 62” arc vented golf course umbrellas can be sought as a representation token during exhibitions, shopping fests, etc or they can be offered as a gift during some special corporate events. We receive large orders for custom navy & white 62” arc vented golf course umbrellas from hoteliers, restaurateurs, sports marketers, coffee shops, technology businesses, etc. 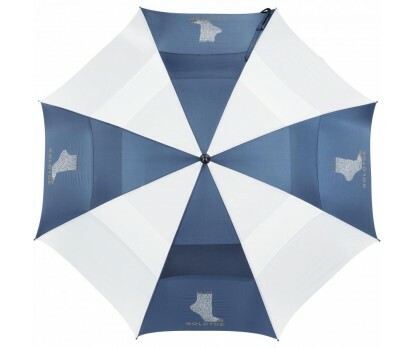 This umbrella can be distinguished by its all lightening resistant frames, large navy blue & white striped nylon vented canopy offered with matching color case and shoulder strap. Imprint area - 6" H x 8" W.